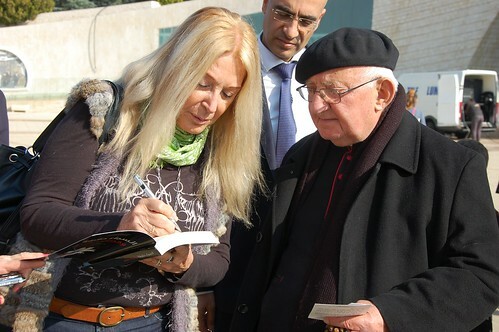 The Lebanese True Life in God group invited Vassula to come and sign the Arabic translation of her bestseller book "Heaven is Real but so is Hell" at the Beirut 60th International Arab Book Fair 2016. Vassula Ryden and Fr. Rolf Schönenberger arrived in Beirut on Friday December 09, 2016 in the afternoon. They were greeted by Georges and Yolla. At 7pm that evening, Vassula and Fr. Rolf joined us at our Beth Myriam Christmas party, hosted for all the families and kids that we serve at our Beth Myriam. There were around 50 children and almost 35 adults. 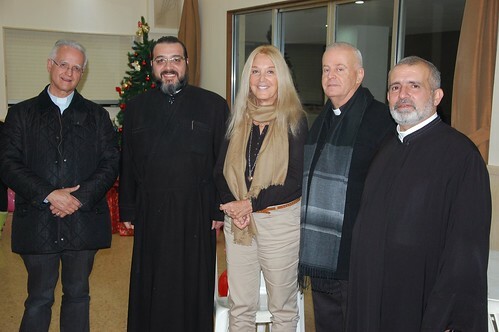 We were honored to have with us the presence of His Eminence Bishop Simon Atallah, MP Nabil Nicolas, Fr. Valentino El Ghoul, Fr. Nabil Abou Jaoude, Fr. Emile Abou Mrad and local politician Mr. Michel Mkattaf. As usual, the Sisters of the Good Shepherd, from the Muslim area, were present with the children that they serve. 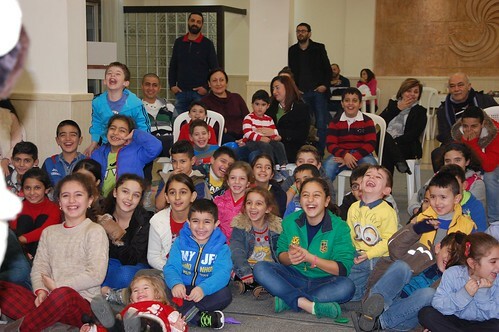 Our big gift at this event was the presence of a small group of True Life in God readers and members from Beth Myriam Syriam Syria, mainly Fr. Assaad Youssef and his two brothers. They drove all the way from Homs to be with us. Yolla opened this event with a PowerPoint presentation about how God called Vassula and how our lady then called her to establish the Beth Myriams. Vassula then presented a small speech, saying that when Jesus is speaking to her, He is also speaking to us because He said that we should remove her name in the messages and replace it with our own name. She explained how the Beth Myriams got started and said that Jesus and Mary know all our needs; that is why everything that people receive from the Beth Myriam does not come from us, but rather from our Lord and our Blessed Mother. She asked everyone to applaud Jesus and our Mother. The party continued with the kid’s program, the food, the Christmas cake, and Christmas gifts. 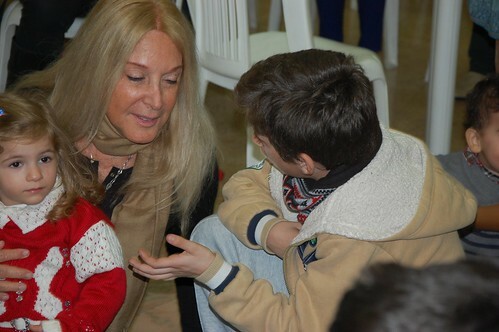 The event was filmed by Noursat (the local Church TV), and the reporter Lea Maamary interviewed Vassula and the guests. A particular case surfaced that evening around a boy who was roughly nine years of age and called Charbel; he attracted Vassula’s attention. He had the same name as the great Lebanese Maronite, Saint Charbel. Vassula said that he was deeply moved by the fact that Jesus was speaking to her and he was asking her deep spiritual questions, ‘like a grown up’, Vassula remarked. His thoughts regarding spiritual matters were rather advanced, coming to him in a most natural way; so much so, that Vassula asked him if he wanted to read the Messages, to which he eagerly nodded. We gave him the book and he held it close to his chest. At the same time, the other boys surrounding him were also listening with much interest. The next day, Vassula and Fr. 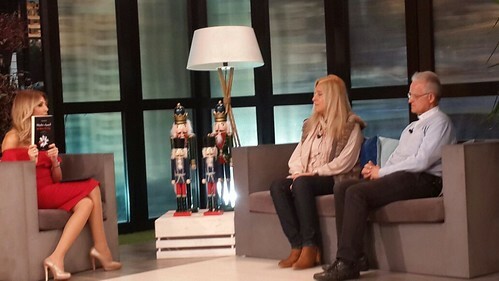 Rolf were hosted on the local morning show MTV ALIVE at MTV Lebanon with host, Roula Safa. Roula asked her "Do you know why God chose you?" and Vassula said that God told her, "Did you not know that wretchedness attracts me? Through your wretchedness I will show my Mercy. In your nothingness I shall show My Authority, My Power and that I AM." Yes, indeed, the power of God is clearly seen best in weakness. The truth is that our inadequacy may actually prove to be our ultimate qualification in serving God. Such is the case when Jesus said to St. Paul: "My grace is sufficient for you, for my power is made perfect in weakness" (2 Cor. 12:9). The next question asked was about her mission. Roula asked her if she believed that God has chosen her to send messages to the rest of the human race. Vassula replied that this message is for everyone. It is not only a calling for reconciliation and repentance, but also, and as is the harder part of her mission, a message to tell the Churches that Jesus wants them to unite in diversity. Fr. Rolf answered a question about his relationship with Vassula; he told the story about when he hosted her in Russia. The best ever retreat he had ever experienced occurred during her stay. Fr. Rolf said that he was especially touched by the detailed prophecy that Vassula had for Russia, because only God would know what was happening in Russia. What the Message claimed about Russia came true. The True Life in God Message that Vassula received talked about the transfiguring of Russia just before the fall of communism. Vassula said that the answers to everyday questions that people have in their minds are in the "Heaven is Real but so is Hell" book and also in the book of the True Life in God Messages because many people who have read the Messages have come to her to tell her that their questions were answered. She also said that we pray for the skeptics. She was not asked by God to convince anybody about the authenticity of the Messages, but to transmit them; people are free as to decide whether or not to believe. Roula further asked Fr. Rolf about the report that was written in the Vatican on Vassula and the Messages; he responded by explaining what transpired through the dialogue between Cardinal Ratzinger with the CDF and Vassula. This interaction produced a positive result. To watch this interview in English and in Arabic, you can view it on this YouTube channel: TLIG Lebanon. Search for "Fr Rolf & Vassula interview on MTV 2016 about HIR book". 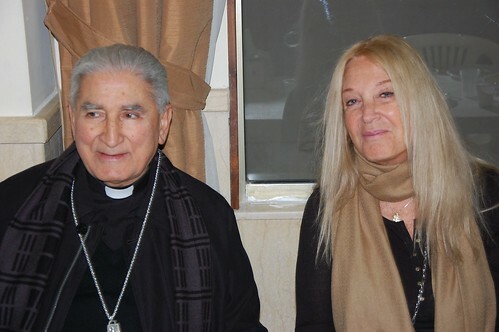 After the interview, Georges and Yolla took Vassula and Fr. Rolf to visit the Tomb of St. Charbel. At 4pm that day, the second big event, which was the signing of the Arabic translation of Vassula's autobiography "Heaven is Real but so is Hell" at the Beirut 60th International Arab Book Fair 2016 took place. We had previously launched a Facebook advertisement of the book, and we attracted almost sixty-thousand persons from the various religions in Lebanon. At the book fair we distributed around 2000 flyers, advertising the book to people from different walks of life and different faiths. At the signing Fr. Rolf and Fr. Assaad Youssef were with us and Noursat was present again to film the event. It is interesting to note that three Muslim Kurds came to the booth and bought the book. One of the organisers asked them how they discovered this book; they replied, saying that they were told about it from a person called Ahmad in Syria. Later that night Vassula and Fr. Rolf were invited to the Magical Palermo Christmas Concert. 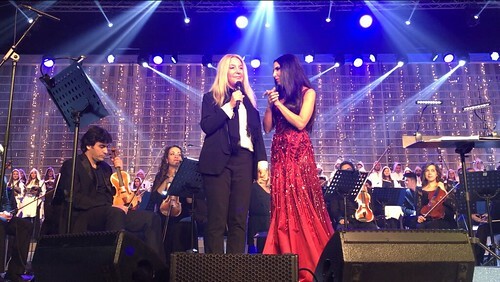 At the end of the concert the soloist Mirna Chaker welcomed Vassula and invited her to say a few words. Vassula got up on stage, thanked Mirna and invited everyone to offer their entire heart as a gift to Jesus this Christmas; not partially, but entirely because love is missing in this world. Our day started with Holy Mass at the Maronite Patriarchate in Bkerke. Fr. 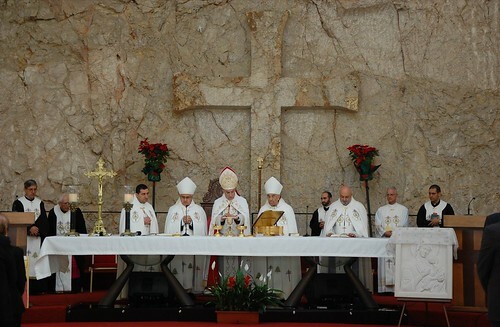 Rolf Schonenberger co-celebrated Mass with the His Beatitude Patriarch Cardinal Mar Bechara Boutros Al Rahi. In his homily, Patriarch Rahi welcomed those in the True Life in God family who were present. After the Divine Liturgy, we went to the reception hall where the Patriarch meets his guests. Vassula presented her new book "Heaven is real but so Hell" to His Beatitude. She showed him the pictures inside the book and explained them to him. She also mentioned her inter-religious meetings with Muslims and Buddhists who gave her the Golden Peace Award for propagating peace. Patriarch Rahi thanked Vassula, promised to read the book and asked a few questions about it. Vassula told him about the existence of Beth Myriam in Lebanon and about the Christmas party that they hosted two days prior. His Eminence Bishop Hanna Alwan, Maronite Curial Bishop, was also present at this meeting and was sitting next to the Patriarch. Towards the end of the meeting, the Patriarch asked us all to take a picture with him. He was holding the "Heaven is real but so is Hell" book in the picture. 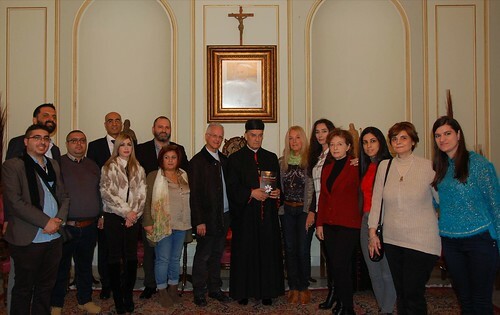 After this meeting, Vassula visited a friend of TLIG Lebanon at the Patriarchate: His Eminence Bishop Roland Abou Jaoude. 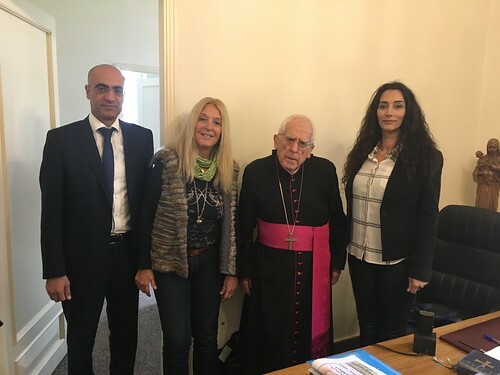 Also earlier, before our patriarchal meeting, right after Mass, His Eminence Tanios el Khoury, the Maronite Bishop Emeritus of Sidon, Monsignor Maroun Kiwan and two other priests met Vassula outside the Church and she offered the HIR book to each of them. 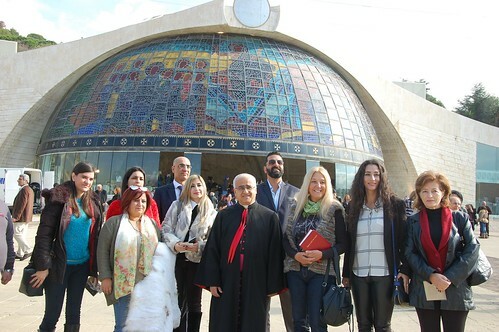 After we left the town of Bkerké, Vassula had lunch with the organisers of TLIG Lebanon. That evening we had our third big event: the conference around the HIR book. The conference started with the Lord's Prayer. Then Yolla gave a small PowerPoint introduction about Vassula and her mission. Following Yolla’s introduction, Bishop Atallah talked about Vassula's call. He called her mission a ‘life reading.’ He said that God has given her the grace to read her life because she has proven that all her intentions are honest; she has no falsehood in her life. He said that God touches the heart of a person with honest intentions. St. Paul and St. Augustine had committed some horrible acts, but they had honest intentions and so God looked at that. He ended his talk saying that Vassula's call tells us to repent in order to build Unity; this can only be done through Love. He called Vassula a messenger of Love. Subsequently, Fr. Rolf gave his testimony; it was similar to the one he gave on TV the day before. In one of his anecdotes, he told us about Vassula’s visit to the Russian Patriarchate, while wearing pants. Normally women go there only in long skirts. Vassula did not want to be a hypocrite. Since she comes to Jesus in pants and He does not refuse her, she then has the liberty to visit the patriarchate in pants. Fr. Rolf said that the Secretary of the Patriarchate thanked her for coming as she was without faking it. After Father Rolf’s anecdote, Vassula started her talk by reminding us that this charisma which she does not deserve is not for her. It was given to her so that she would give it to everyone without any distinction between Christians, Muslims, and Buddhists etc... God sent her everywhere in small steps. Then she said that the "Heaven is real but so Hell" book is her story as well as God's story with her. The book gives an idea of how God works through the person that He chooses as an instrument. It describes how patient, sweet and tender God would be with that chosen person. She previously did not know God and she had a very severe image of Him, as if He was unapproachable. It was the Father who started speaking to her after her angel; He told her that He was her Father. She said that when God speaks it is not as if a human person is telling us "I am your father". When God speaks it's different. It's like a command, but told with kindness, love, tenderness and all that is good. When He speaks to her in the book, He is speaking to everyone. So when He uttered those first words, her soul, as if she was sleeping, like in a coma, all her life, woke up all of a sudden and recognised her Father. It was as if she knew Him, but had somehow forgotten him during her life. It was as if she had amnesia and her memory came back, recognizing her Father. As a simultaneous impression, she felt Him as if He was a member of her family. Then He told her that she belonged to Him; she descended from Him and she was His offspring. His voice was so gentle. Then He asked her to pray the Our Father. She knew that prayer because she used to pray it at school. She blurted out without thinking, "yes dad", very intimately. She was afraid because the word ‘dad’ came out of her mouth without control. The Lord, immediately, reassured her not to be afraid. He took this word ‘dad’ in his hand as a jewel that was offered to Him. This illustration shows us that God wants us to become intimate with Him. After all, the Lord Jesus called Him ‘Abba’ which means ‘dad’ not without reason; it was to depict the closeness God wants from us, and to realize that He is Father, our real Father before our biological father. Vassula further explained how the Lord made her repeat the Our Father all morning. We sometimes pray it like a parrot, she said, because we know it by heart. After repeating it incessantly, every sentence finally came out from her heart, as if she pictured Him in front of her, meaning every word. After each and every sentence, God ultimately told her that it was good. One day, The Father asked her this question: "Do you love Me?” of course, she answered "yes", so He replied: "Love Me more." Years later He explained what He meant by ‘more.’ He wants equality of love. We need to return to Him the Love He gives us. The Lord says that on Judgment day we will be judged according to the measure of love we have given on Earth. That is why it is very important to love. When we pray, or when we serve, all our acts must be done with love. Without love they count for nothing. He teaches us to love by instructing us to die to ourselves in total effacement so that the Holy Spirit may transfigure us. He asks us to ‘allow (permit) Him’ to transfigure us. He, who is God, above all, is so delicate with us and asks for permission because He respects the free will which He has given us; He does not want to violate our liberty. For the first three years, no one other than Vassula’s family and close friends knew that she was receiving messages. God was teaching her daily. After three years, the Lord wanted the Messages to be brought to the public. He told Vassula that He was going to make this spreading of the Messages possible; she was not to go around telling people that she was receiving messages. So one day a neighbour who heard about her charisma, asked her if she could bring some friends to Vassula’s apartment to hear her testimony. Vassula agreed to do it, and she thought that the neighbor would be bringing 2 or 3 persons. Instead, her neighbour came with 30 persons. In the end, a lady who organized pilgrimages thought it was a very important testimony. She told Vassula that she was going to organize a big witnessing event at her parish and she managed to gather 300 people. On the day of the event, Vassula was terrified to speak. She prayed and asked the Lord to take away her panic so she could glorify Him. As she was walking towards the congregational hall to speak, she did not feel the ground; it was as if she was floating. She felt as if something entered her whole body like a tranquilizer, but at the same time a power. With that, she knew that even if the best theologian was sitting in front of her, she would not be afraid, because she knew that what she was going to say came from Jesus. Since that moment, she was never again afraid to speak. After telling this story, Vassula continued her talk saying, "What I wanted to show in this book is what Jesus requires of us today. First, the Lord asked me majestically: "Which House is more important? My House or your house?" I knew that He was talking about the Church, so I said "Your House Lord." With Majesty, the Lord said "Revive My House, embellish My House and unite My House." I told the Lord that I didn't know anything about His house, and that He should approach someone else who knew. The Lord said: "No, I want you, a nothing; in your nothingness I will show my power and that I AM. Die to yourself and allow my Holy Spirit to breathe in you and allow Me to form you". So that was the first step Vassula had to do, allow God to work in her. Vassula brought-up the theme of repentance: what is true repentance. We will know the Will of God only through the Holy Spirit. The example she gave was of a cup which is filled with our sins; therefore, it does not leave any space for the Holy Spirit. So, she went on while holding a cup in her hand, “we need to empty our sins through confession and repentance. Now, when we are empty, we have a ‘kenosis’ (a space) in us; all this empty space is now ready to have the Holy Spirit come in and fill us with His Light." After this speech, Vassula offered time for questions. Someone asked her about Unity: why is it taking so long to transpire? She said that Jesus told her: "Did you know of a city that was built in one day?" At the end of her talk Vassula made it clear that when God says ‘soon’ in the Messages, it could be 2000 years. However, when He is was talking about Unity Vassula asked Him, “Will it be Your soon, that could be 2000 years, or my soon?” the Lord replied to her: your soon. When He says ‘imminent’ He is talking about His coming, but no one knows when this will occur. As for the chastisement, no one knows the day and the hour; only God knows. The following priests were also present at this conference: Fr. Camille Efrem, Fr. Maoun Hayek, Fr. Jean Pierre Khoury, Fr. Joseph and Fr. Nidal. After the talk, Roula from TLIG Lebanon, asked various people to give their testimony about the event. A 15 year old girl said that what really touched her is how Vassula speaks with simplicity, without pretence, and that gives her credibility. A man said that he learned more about the Unity of the Church during the talk and that through Unity the wars and problems in the world would stop. Another woman mentioned that what touched her was that Vassula does not answer a question to which she does not have an answer. To her, that is a sign that Vassula comes with a message from God and not from herself. The last person said that she fell in love with Jesus through the Messages of True Life in God. It was through the Messages that she learned about our intimacy with the Lord and realized that God is with us, near us, and is not an unapproachable God. The fourth big event we had was an inter-religious meeting that was held and filmed at a TLIG Lebanon member's parent’s house on Monday Dec 12, 2016. We were honored to have at this meeting Bishop Simon Atallah from the Maronite Church, Sheikh Iyad Abdallah a Sunni Muslim, Sheikh Mohammad Ali Al Hajj a Shiite Muslim, Sheikh Nizam Boukhzam from the Druze faith, Fr. Emile Abou Mrad from the Greek Orthodox Church, Fr. Rolf Schonenberger from the Roman Catholic Church and of course Vassula, as a Greek Orthodox lay person. The main topics discussed during the meeting focused on how we could build bridges between Muslims and Christians today and what could be done to obtain Church Unity. 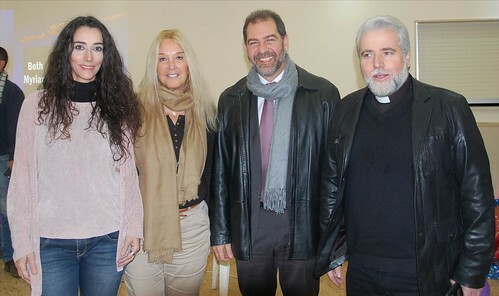 Vassula's mission, the Spirituality of True Life in God calls for a harmonious unity among Christians and a collaborative harmony among people of all faiths. The guests emphasized the need to spiritually educate people and defined inter-faith unity as unity on the human level with respect to the culture and faith of every person. Every person must express his/her faith freely. Verses from the Bible and the Koran were quoted during the meeting to show that love and collaboration must be at the heart of this dialogue; without them we cannot advance. Vassula and Fr. Rolf insisted on the maintenance of repentance and humility as keys to unity. Pope Francis's inter-religious efforts were also mentioned in the dialogue. Vassula ended by saying that God will not differentiate us on Judgment Day, but He will judge us according to the measure of the love we have had for others here on Earth. At the end of this inter-faith meeting, we all had lunch together. Vassula invited the guests to the TLIG pilgrimage in Russia, in September 2017. She also offered them her book. It is important to mention that this was the first ever inter-religious meeting organized by a TLIG group. Normally, when Vassula attends such meetings they are organized by the religious men themselves. In all, it was a very successful mission. We thank God for opening all these doors.